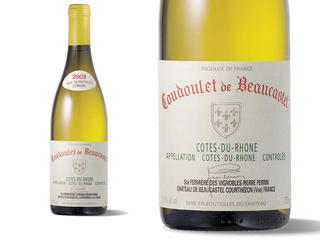 The 2003 Beaucastel Cotes du Rhone Coudoulet blanc exhibits an apricot liqueur-like note, low acidity, and a fat, corpulent personality in a style that requires consumption over the next year, as it will be short-lived. The 2003 Cotes du Rhone Coudoulet blanc, an equal part blend of Viognier, Marsanne, and Bourboulenc, exhibits plenty of honeysuckle and citrus oils in the nose, medium body, wonderful freshness, and a chunky, fleshy, low acid finish. Drink it over the next 1-2 years. P.S. Of considerable interest during my September, 2004 visit was Francois Perrin’s decision to open a 1980 Chateauneuf du Pape blanc (rated 94). He did this because I have been visiting Beaucastel for nearly 26 years, and in its youth, I remember this wine was quite impressive. At about age 6-7, it seemed to be completely dead and oxidized, and had taken on an old gold color. However, according to Perrin, about five years ago it came alive, and this bottle was spectacular. The aging of not only white Hermitage (which is primarily Marsanne) but also these special cuvees of Roussanne (particularly Beaucastel’s, but I suspect also other Roussane-based white Chateauneuf du Papes such as Grand Veneur’s La Fontaine and La Nerthe’s Clos de Beauvenir) is bizarre, and defies any rational explanation. They are compelling when first released, then become nearly undrinkable only to re-emerge in the future, but one is never quite sure at what age that will happen. It is one of the mysteries of wine, but it is reassuring to know there are still things the so-called experts cannot explain.